Learn how to be a more effective product owner. 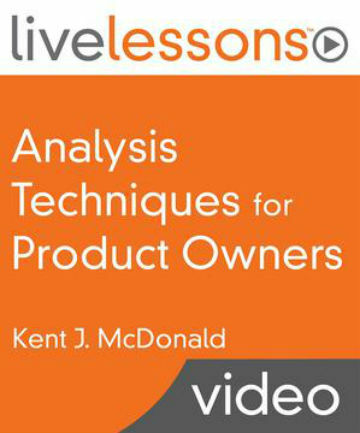 These video lessons are for product owners and team members who work with product owners. Have you just been asked to be a Product Owner for a project supporting your business unit? Are you a business analyst that has been asked to play the Product Owner role? Are you a business analyst working in an agile fashion who has been asked to support a Product Owner? Are you aware of various analysis techniques but aren’t sure how to apply them in an agile setting? Understand your Stakeholders How to learn about the people whose problem you are solving and the people who are going to use your solution. Understand the Need How to figure out the real need that you must satisfy, determine if it is worth satisfying, and share that understanding with your team. Understand the Solution(s) How to explore multiple solutions and describe the solutions that seem best, all in a way that is meaningful for everyone working on the project. Organize and Persist Solution Information How to visualize progress and the aspect of the solution you are working on, as well as a way to persist key information about the solution for future reference. Understand When to Use Each Technique How to apply the appropriate analysis techniques for your situation. Analysis Techniques for Product Owners is available on Safari – O’Reilly’s online learning platform. On Safari you gain access to these videos as well as book, video, audio, and interactive content from more than 200 of the world’s most respected publishers, including Pearson, Packt, Wiley, HarperCollins, and others. Sign up for a 10-day free trial to view the video lessons. Lesson 1 discusses concepts to help provide perspective when determining the appropriate analysis techniques. Those concepts include why it’s important to start with needs and then identify corresponding solutions, why it’s important to maximize outcome with minimum output, and the complementary activities of discovery and delivery. The lesson finishes with a description of the case studies that will be referenced when describing the techniques in the remainder of the lessons. Lesson 2 covers techniques that are useful for understanding the stakeholders. The first two techniques are useful for understanding the people whose needs you are trying to satisfy better known as stakeholder analysis. The Stakeholder Map helps you to determine how to engage with your stakeholders, and you can use the Commitment Scale to determine what you need to do to get your stakeholders to the appropriate level of commitment for your project. The other two techniques in this lesson help you better understand the people who are actually going to use the solution you deliver; let’s call this user analysis. User modeling is a great way to compile a comprehensive set of user roles and personas provide additional context about the people who use your solution. Understanding context is familiarizing yourself with the nature of the business and sharing that information with the rest of the team. This lesson introduces several techniques for understanding the organization as a whole and using that information to guide decisions about your projects. The techniques covered include the purpose-based alignment model, six questions for understanding your differentiators, and the context leadership model. A key, but often overlooked, aspect of IT projects is figuring out the real need that must be satisfied, determining if it is worth satisfying, and sharing that understanding with the entire team. This lesson introduces a set of techniques that are helpful for performing those activities, including decision filters, the project opportunity assessment, and the problem statement. Once we understand the need we’re trying to satisfy and we’ve determined that it’s worth satisfying, we should investigate possible solutions. The plural form is intentional. Project teams often limit themselves by focusing on one possible solution too soon instead of leaving their options open. In many cases, there are multiple options. In this lesson, you learn a variety of techniques for exploring multiple solutions and describing the solutions that seem best, all in a way that is meaningful for everyone working on the project. These techniques include impact mapping, story mapping, collaborative modeling, acceptance criteria, and other examples to further describe specifics of solutions. This lesson describes techniques that help teams visualize progress and the aspect of the solution they are working on, as well as a way to persist key information about the solution for future reference. The techniques described in this chapter include: discovery board, definition of ready, delivery board, definition of done, and system documentation.